Carnival was the breaking point. An event meant to highlight Rio de Janeiro and bring thousands of tourists was instead marked with crime and violence. In the months leading up to February's carnival, Rio de Janeiro had already been struggling to keep the peace. The state’s government was often late paying the police due to a budgetary crisis. The Politicians in charge of that same budget would end up behind bars on corruption allegations. 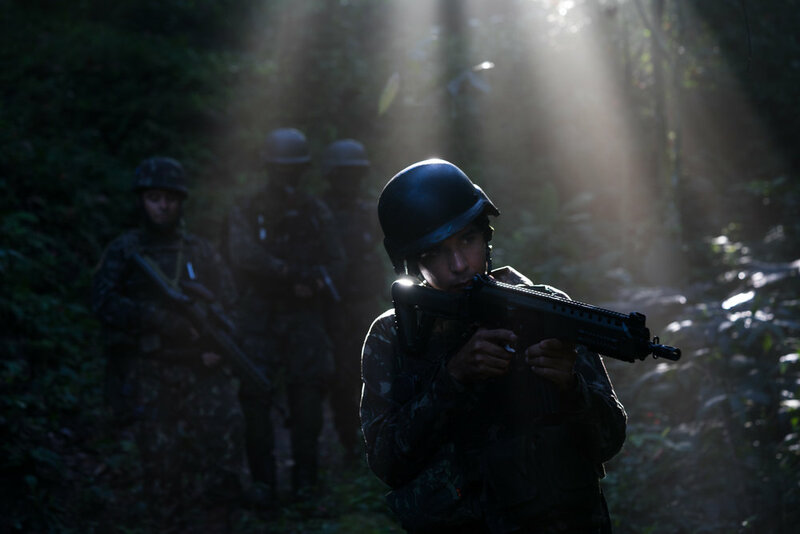 In September a running gunbattle between opposing drug gangs broke out in the middle of the day in Rocinha, a favela that according to the government was “pacified.” Public confidence in the police reached a new low as security forces stood at the base of the community, unable to intervene until 3000 Brazilian Soldiers and Marines showed up and stormed the shanty town with helicopters and six-wheeled armored vehicles. It was the broadcast on Brazilian TV scenes in which mobs of shirtless young men robbed and beat those taking part in the carnival festivities that finally forced Brazil’s federal government into action. On Feb. 16, at the request of Gov. Luiz Fernando de Souza, President Michele Temer activated a never before used provision in the constitution to take control of Rio de Janeiro’s security. Although he was quick to point out that the intervention was civilian mandated, Temer put the military in charge by choosing Gen. Walter Souza Braga Netto to head the operation. Netto quickly chose a team comprised of mostly military men to lead the intervention. Whereas many Brazilians expected the army to be deployed in large quantities to the streets immediately, the General’s response was more restrained. To reach these objectives, Netto went to work replacing leadership in the police battalions, procuring new equipment and vehicles, and instituting remedial training in areas like marksmanship. He also increased the operational tempo of the security forces. In the ten months that the intervention was in charge, they conducted over two hundred operations throughout the state. The more aggressive stance saw the military invading areas that had once been considered off-limits to police. The military also started taking its first casualties in the process. Now the federal mandate is coming to an end. The intervention is to officially be finished on Dec. 31 when authority will pass to incoming Gov. Wilson Witzel. His predecessor, Governor de Sousa, who requested the response, is currently in prison on charges of corruption. The same conservative wave that brought Bolsonaro into power also elected Witzel. The two candidates both campaigned on platforms promising to be hard on crime and to empower police to use violent force against criminals. The incoming governor has suggested during his campaign that he would be in favor of using armed drones and teams of snipers against gangs throughout the state. Leonardo Zaneli, a member of Witzel's transition team, spoke about some of their plans on taking office which include, increasing police patrols, creating an office to combat corruption, focusing the government's efforts to investigate large criminal organizations, and integrating state police with federal resources. "We have a transition plan in place, and although we've been very grateful for the intervention and the legacy of equipment and training it leaves, going forward things will be up to the state, and we're ready," Zaneli said Saturday. That interventions legacy, according to government statistics, includes halting an upward trend of murders and thefts in Rio de Janeiro. November was the month with the lowest number of killings in three years, down 18 percent from the year before. Cargo thefts are down 23 percent. Brazilian human rights activists are saying that despite the reduction in the crime stats, it comes at the cost of having further innocents caught in the crossfire and that little has been done to combat the impunity in which police kill. About a month into the intervention, a 28-year old fisherman named Deivison Farias de Mouro was sitting on his porch cradling his newborn son in his arms and speaking with his brothers as they cleaned fish. Suddenly a gunshot cracked the air, and then two more. De Mouro fell to the ground, a bullet wound leaking blood from his chest inches from where he had held his child. Deivison's brother Diogo was there during the shooting. "He died instantly. As soon as he hit the ground, he was out, and the baby fell to the side." Diogo said that when he looked in the direction of the gunshots, he saw a group of military police pointing their guns to where Deivison had stood a moment ago. "We knew it was the police that shot him. We even got witnesses saying they saw the police shooting in the direction of our house. But the authorities never did an investigation. On the first day, the homicide department came and said they would be collecting the police's guns and doing a ballistic analysis, but none of that ever happened," Diogo said. In the months following Deivison‘s shooting his family has not heard back from the government regarding the status of the case. Messages from the family to the public defender assigned to the case have gone unanswered. Deivison's mother, Marlene Farias de Silva, has trouble sleeping, and the kids in the household run for cover under tables or furniture at any loud noises. "Deivison was a good man. He always worked hard. But the police killed him, and now his son has been left with nothing. We get no help from the government. They just ignore us." An official statement from the police at the time said that the soldiers rushed to the location when they heard gunshots but did not fire themselves. The case is ongoing. A military police operation just five days before the Farias shooting and less than half a mile away left eight individuals dead. The police say that in that case, all those killed were criminals. Resident's living in the area say that although some of the eight were involved in trafficking, at least two were innocents caught in the crossfire. Additional oversight on police killings is something that both Bolsonaro and Witzel have shunned. They instead say that authorities need to be empowered to move against those that violate the peace. On the first day of 2019, the military led intervention into Rio de Janeiro’s security will be over. The incoming government, however, has committed to a military strategy when dealing with the city’s violence. In an interview with Brazilian paper Estado de S.Paulo last month, Witzel reiterated his belief that police need to be allowed to use pre-emptive force. "The right thing to do is to kill any criminal that has a gun. The police will do the right thing; they will aim at [the criminal's] little head and ... shoot! Just to make sure there is no mistake."